ELLINGTON FIELD, TX - July 28, 2011 - MADE IN SPACE, a start-up dedicated to providing solutions for manufacturing in space, announced the successful completion of testing 3D printers in zero-gravity. The test took place on multiple zero-gravity flights provided by NASA's Flight Opportunities Program. Two modified off-the-shelf 3D printers were tested, including one provided by their partner 3D Systems, a leading provider of 3D printing solutions. The company also tested a custom-made printer that's designed to manufacture structures in space. Several objects were printed during the flight, including a scaled-down wrench that became the first ever tool printed through partial zero-gravity. They also built a part that was designed by Within Technologies to be optimized for complete strength-to-mass ratio. MADE IN SPACE believes the advantages of 3D printing -- limited material waste, the ability to build complex geometries, immediate production time, and minimal human involvement required -- make it the perfect manufacturing system for outer space. "3D printing and in-space manufacturing will dramatically change the way we look at space exploration, commercialization, and mission design today." said Aaron Kemmer, CEO and Co-Founder of MADE IN SPACE. "The possibilities range from building on-demand parts for human missions to building large space habitats that are optimized for space." Once the printers and material are set in space, missions will have the freedom to build what they need when they need it and not have to rely on transport from Earth. The company flew the printers in order to better understand how 3D printing works in a space-like environment. 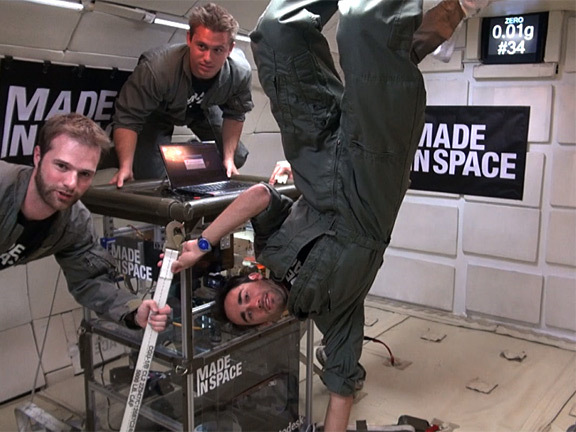 "Based on past research, we already knew that 3D printing works in zero-g to some degree. The question we are answering is how well does it work." said Jason Dunn, CTO and co-founder. For the flight, MADE IN SPACE partnered with Autodesk,a world leader in 3D design, engineering and entertainment software, who provided software and techniques to optimize space-based design principles for practical applications. The test in zero-gravity is a crucial first step for the company. Over the next month, they will be conducting post-flight analysis, and have plans for further zero-gravity testing over the upcoming year. For more information and on-going updates from their experiments, visit www.madeinspace.us.